Hey, alright! You found me. Not like I didn't leave enough hints on Facebook and Google+. Some might have gotten tired of all that repetition but hey, that's what's known as marketing. Which reminds me I've gotta pick up some milk, bread and beer today. Almost a year ago - it was November 2012 - I retired Pause Ponder and Pun. Hey, there's only so many funny pictures on the internet - that aren't cats - crying out for a caption. Well, guess what? We're bringing it back! I checked and there's a whole bunch of new pictures out there just screaming for your captions. So, same deal as before. I'll run a pic on Wednesday, you leave a comment, the winner will be posted Saturday. I'll post the top three captions and the winner gets that dufus badge up there. "Badges, we don't need no stinking badges," I hear you say. Sure you do. You can post it on your blog. It's priceless. So here's this week's pic. Good luck. And when you're done here, spin on over to my good blogging buddy Screaming MeMe's place. She's back in the blogging business after a bit of an hiatus and has a caption thingy going on too! As well, the lovely and charming Chelle B, who is known around these parts as the offensive...er, um, make that offended blogger, is running a caption contest as well. My God, we're taking over the internet. Drop by both their blogs. Tell 'em dufus sent you. "I think I found the wishbone!" If you train hard, concentrate, focus and eat at Taco Bell many times, you can gain the ability to fly using the power of your own farts. 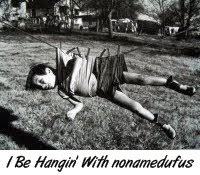 Now that I think about it.... inventing a new sport called Bungee-less Jumping might of been a bad idea. OMG! I am terrible at coming up with captions - but that photo is cracking me the hell up! 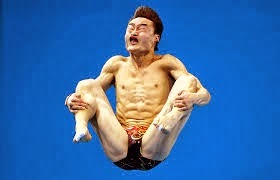 Competitive Olympic athlete, Phuc Yu, won the gold with his famous colon cleansing triple twist sphincter splash. Chow Ling's first attempt at base jumping ended badly when he forgot to properly secure his parachute. After laughing at his wife's tears, Phuc Dat volunteered to demonstrate bravery during a Brazilian Wax. After decades in space, China's first satellite finally re-enters the earth's atmosphere. Everyone's jumping for joy, now that Pause Ponder and Pun has returned. Bahahahahaha, nice one Malisa! I don't know what the phuc I am supposed to come up with after that! 17th century glassblower accidentally blows himself inside jar. Nicky, I'm not even going to try. THIS is why I usually drop by, tell Dufus I like his photo, sit back and wait for the winner to be announced. So far you've got some dandy entries. I got nothin' but I'm loving that you're back.